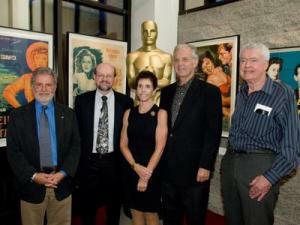 L-R: Acad president Sid Ganis, JB, Juliet Rozsa, Bruce Broughton, Rudy Behlmer. For Rozsa’s centennial celebration, I worked with Academy execs to design a weekend of classic films (including The Thief of Bagdad and El Cid) and an evening of clips and talk culminating in a screening of Ivanhoe. Joining me on stage were composer Bruce Broughton, film historian Rudy Behlmer and the composer’s daughter Juliet Rozsa. All offered valuable insights and reminiscences. Here is Susan King’s preview of the weekend, featuring comments from all of us.